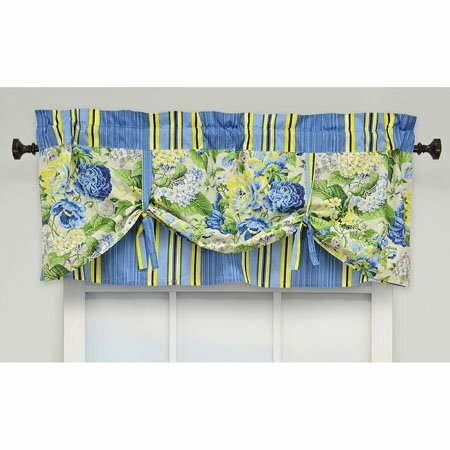 Floral Flourish Lined Window Valance features a beautiful garden of blooms including hydrangeas and peonies in rich hues of blue, yellow, and light green on a clean and crisp ivory ground. The floral print is layered over a coordinating stripe and pull up by striped ties creating a draped detail. 52" wide x 21" long. 2" header. 3" rod pocket and 3" back tabs fit up to a 2 1/2" rod. Machine wash cold, gentle cycle. Tumble dry low. 100% prewashed cotton with poly/cotton lining.